Preheat oven to 450 degrees and line a cookie sheet with foil. Don’t worry if you don’t have foil. You can skip this step. It just makes clean up a little easier. Chop your cauliflower into small pieces a little larger than a quarter or so. Whisk the flour and water in a bowl until smooth. No lumps! Toss the cauliflower in the flour mixture and spread on the cookie sheet in a single layer. Bake at 450 degrees for 15 minutes, mix them a bit about halfway through so they crisp and brown evenly. While the cauliflower is baking, mix the sriracha and vinegar in the same bowl that you used to toss with the flour. Hey, save yourself from cleaning an extra bowl. 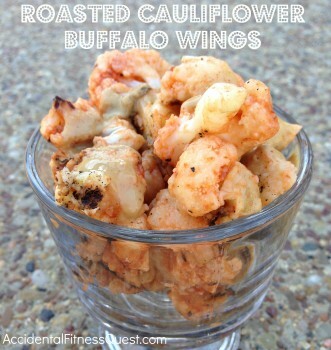 After 15 minutes, remove the cauliflower from the oven and toss with the sriracha mixture to coat well. Spread back on the cookie sheet and bake another 3 – 5 minutes until done and crispy. Remove from oven and serve with celery sticks, cucumber sticks, blue cheese or other dipping sauce. Makes 4 servings at approximately 68 calories – 3g protein, 14g carbs and 0g fat. I used the other half of head of cauliflower leftover from the street tacos I made the other night. It’s about 4 cups or so or just under a pound if you want to use frozen for this recipe. I decided to dip my wings in a peanut sauce so I mixed 2 Tbsp of PB2 with 1 Tbsp of soy sauce and water to make a dip. Now I will mention that they do make buffalo sauce already made and you can get it in any grocery store. I’ve never actually tried it though since they contain dairy and The Kid can’t have them with her allergy. It’s just as easy to whip up sriracha and vinegar, plus you can use the sriracha for other things. You can sub in buffalo sauce or another spicy sauce for the sriracha and vinegar here if you like. I wouldn’t skip the flour mixture since that gives the florets a crust for the sauce to stick to. Otherwise you’ll get a nicely spicy cookie sheet and not so much spicy “wings”.